This data provides information about the number and types of applications that HM Land Registry completed in May 2017. Transaction Data is published on the 15th working day of each month. The June Transaction Data will be published at 11am on Friday 21 July 2017 at HM Land Registry Monthly Property Transaction Data. The monthly Transaction Data shows how many applications for first registrations, leases, transfers of part, dealings, official copies and searches lodged by HM Land Registry account customers were completed. For an explanation of the terms used, see abbreviations used in the Transaction Data. Transactions for value include freehold and leasehold sales. Most searches carried out by a solicitor or conveyancer are to protect the purchase and/or mortgage. For example, a search will give the buyer priority for an application to HM Land Registry to register the purchase of the property. 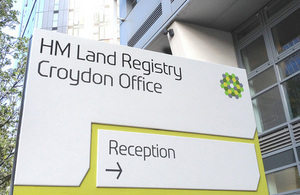 As a government department established in 1862, executive agency and trading fund responsible to the Secretary of State for Business, Energy and Industrial Strategy, HM Land Registry keeps and maintains the Land Register for England and Wales. The Land Register has been open to public inspection since 1990. With the largest transactional database of its kind detailing more than 24 million titles, HM Land Registry underpins the economy by safeguarding ownership of many billions of pounds worth of property.